Get Daisy-inspired deco elegance for your special day. 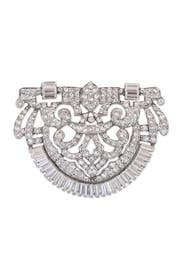 This gorgeous comb by Ben-Amun is a beautiful wedding accessory for the modern bride. 1920's style silver plated comb with Swarovski crystals. 3" wide and 1.5" long. It was a great quality clip for my wedding hair. When wearing an up do just remember that it's heavy so can't be clipped lower on the scalp. This piece is gorgeous! 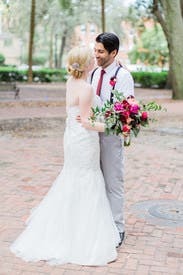 It was perfect for my big day! Perfection! Not to heavy, but to cheap and light either! 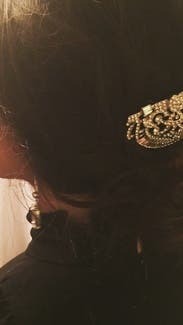 I sparkled on my wedding day - and this comb was perfect!! The comb stayed in all night. My hairdresser had an easy time securing it, and after it was on, I didn't even feel it there. I was jumping around dancing at the reception and it didn't move once. The sparkle is incredible. It looked beautiful in person and even better as a memory saved in our wedding photos. 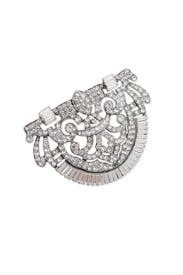 If you are looking for a show-stopping piece, look no further! It was beautiful! Also, my wedding was Art-Deco with a fan theme, so it could not have been more ideal! Wore this in my hair on my wedding day. It wasn't too heavy at all, but I had the hair stylist secure it with bobby pins just in case. It stayed put all night & I received lots of compliments. Such a nice comb for my hair. It stayed in all night. This is a stunner. It is very brilliant and bright but not huge. It is heavy, but it didn't not have to be readjusted all night. You will want to use some extra pins to get it to hold tight. It looked beautiful in a messy updo. I loved it so much I wore it to work as well with just a side pulled up. Worn for Daughter's wedding - Beautiful! This comb is GORGEOUS & heavy. So it's worth it - but it takes a few pins to secure it. One of my favorite pieces of the items I wore during the wedding weekend. I would LOVE to own this. 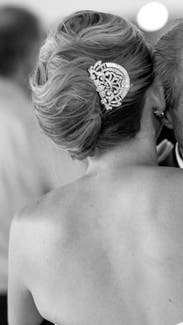 I loved this hair comb accessory. It was perfect. Except it kept falling out, I think the original place in my hair was too bulky for it (pictured). So I pinned it. It lasted for the important parts of the wedding and photos. 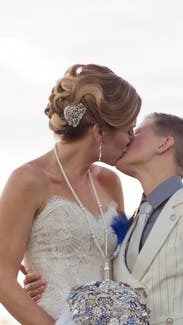 But at the reception I switched the location in my hair where less hair was and it stayed in with no problems. Beautiful accent for my wedding day! Loved it! Wore it on my wedding day. 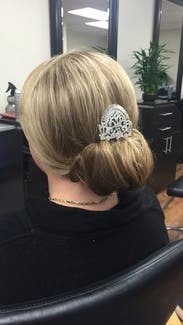 A bit heavy but I wore it on my bun and it was perfect for my Gatsby theme! I wore this piece to a Great Gatsby-themed wedding. It definitely stood out among the many other jeweled headpieces and was absolutely stunning. Loved it! Wore this to my company's 20s themed holiday party. Received a lot of compliments from the other stylist at the salon. This pin has a little weight to it (but not heavy) so my stylist secured it with extra pins. Very comfortable wore it all night. I highly recommend and would rent this again. Perfect for a Roaring 20's themed party! Heavy, but I have thin hair and it stayed in all night. Beautiful comb, art deco fabulous. A little heavy. This comb beautifully matched the art deco bracelet I wore that belonged to my sister-in-law's great grandmother, from the 1930's (my something borrowed). It was a little heavy (probably because it is such a high quality piece) and my hairstylist had to reinforce it to keep it in place all evening. I got so many compliments and did not want to send it back. 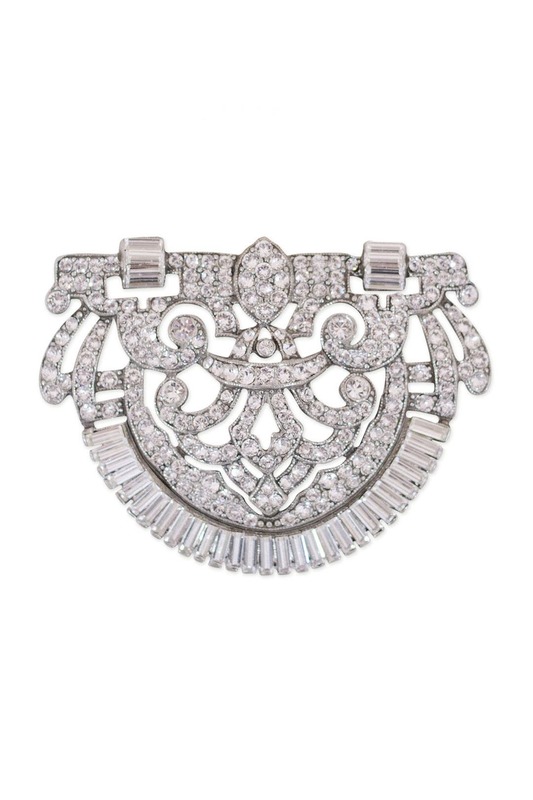 Perfect art deco piece -- not too big or too small. Exactly what I wanted -- classic, yet unique and not too much. I wore my hair down and swept to the side and this was the perfect accent piece. Not too heavy and stayed in all night. Really nice piece, high quality. Love the Art Deco look. Not terribly shiney, but do you want you hair to overpower your jewelry? 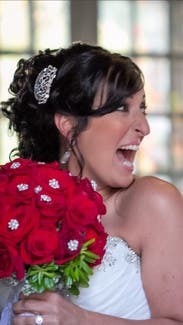 It was my son's wedding and everything was perfect, from my professional makeup to the hair! This comb is very heavy. Be prepared to really secure it with lots of pins to your hair. The pic I provided shows how I wore it for the wedding. I attached the comb to my hair with the comb itself and using bobby pins. I also tied the veil to the comb. I had a very long cathedral length veil and it was super windy that day. The comb never fell out! 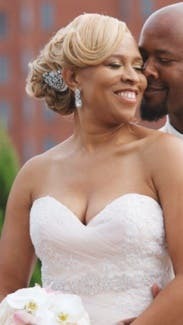 After the ceremony and pictures I put it on the side of my head for a different look. This was so pretty in person, I rented it to put in my hair at my wedding reception, but ended up taking it out after just a little while because it was SO heavy and kept falling out of my hair. Very very beautiful, probably with an up-do it would have worked much better, my hair was half up and I just don't think the clip had enough hair to hold on to. But still very pretty! I wore this when we eloped on the beach. It was gorgeous. Very heavy. We used pins to hold it firm. It worked, because it required no adjustments, in spite of a beach wedding and a walk across the street for dinner afterwards. 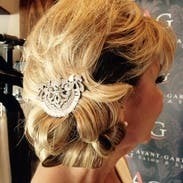 Loved the hair comb and it was perfect for a Gatsby party. It wasn't too heavy and stayed secure in my hair all night. 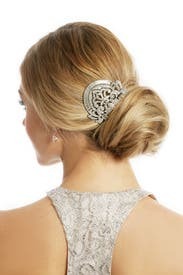 This hair comb was exactly what I was looking for for my wedding look. The piece arrived in great condition - very sparkly. It was large enough to stand out but not too big. It also wasn't too heavy - it stayed in place all night! This piece was perfect for my wedding. It was just the right size and made me feel more glamorous! Easy to wear, comfortable, good condition! I got a lot of compliments on this piece and still love seeing it in the pictures.